The US President made the suggestion on Twitter. 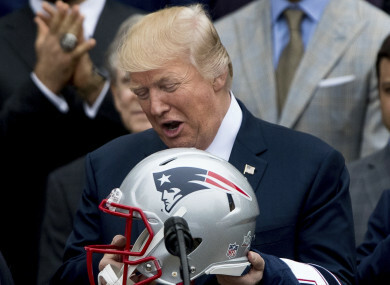 US PRESIDENT DONALD Trump has suggested stripping the NFL of “massive” tax advantages, to punish the players who participate in the anthem protest. Players across the country are continuing to take a knee prior to games, despite Trump’s controversial comments that any players who refuse to observe the anthem should be fired. He also advised the public to leave the stadium if they see players kneeling during the Star Spangled Banner. In an effort to further curtail the protest, Trump has now proposed taking away the NFL’s tax advantages. “Why is the NFL getting massive tax breaks while at the same time disrespecting our Anthem, Flag and Country? Change tax law!” Trump tweeted on Tuesday. The NFL gave up its tax-exempt status in 2015, but individual teams and the league itself often extract hundreds of millions in taxpayer dollars to help build new stadiums. Additionally, when the National Football League and the American Football League merged, Congress waived usual antitrust legislation, allowing them to essentially create a monopoly on professional football. Trump, however, stands accused of political grandstanding and wasteful spending of his own after Vice President Mike Pence seemingly flew from Las Vegas to Indianapolis over the weekend just so he could leave a Colts game early after a few dozen players knelt during the playing of the national anthem. The trip most likely cost taxpayers up to $250,000. Trump is trying to push a tax plan through Congress, but his agenda has stalled amid infighting within the GOP. Email “Donald Trump calls for change in law to strip NFL of 'massive tax breaks' ”. Feedback on “Donald Trump calls for change in law to strip NFL of 'massive tax breaks' ”.